The four major professional sports leagues have shied away from placing sponsored advertisers on players’ jerseys but the Women’s National Basketball Association has capitalized on the practice since 2011. And the NBA will soon follow the WNBA’s example. The revenue-generating move helps a league struggling to grow a fan base: game attendance is half that of the men’s league. Even for successful franchises like the Phoenix Mercury, who have won three WNBA titles, the jersey ad displays are arguably the reason they are still around the Valley. “It’s kind of a game changer in terms of teams and making their path towards profitability. It’s just sort of a business reality for us,” said Vince Kozar, vice president of operations for the Mercury. The WNBA has struggled with fan attendance since it began 20 years ago. During the 2015 season, the WNBA averaged 7,318 fans per game, down 3.4 percent from 2014. In comparison, the NBA averages 17,826 people per game with significantly higher TV ratings. The jersey ads are a financial boost to the WNBA. “Revenue-wise, it’s our biggest partner,” Kozar said of Casino Arizona. “They’re our marquee partner not only across the front of the jersey but they’re the presenting sponsor of the Phoenix Mercury.” He declined to provide the financial terms of the deal. Amid controversy, the NBA will begin selling ad space on player jerseys starting in the 2017-2018 season. 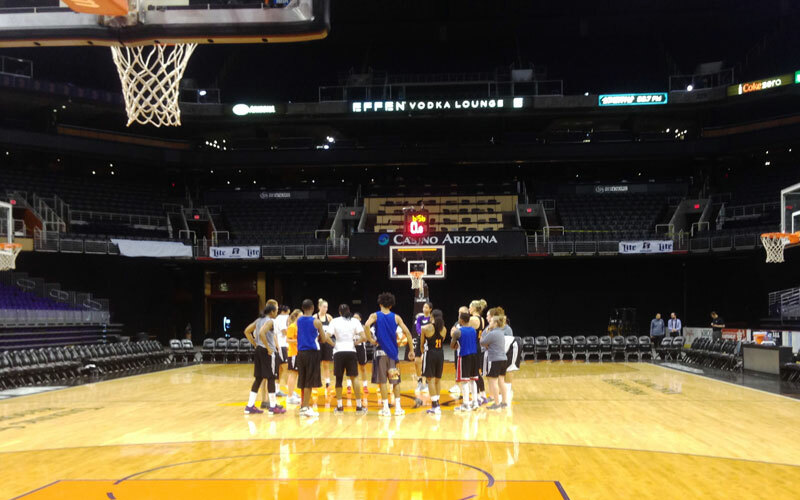 “With the NBA doing it, they’re just copying us…good for them,” Australian-born Phoenix Mercury forward Penny Taylor said a team practice..
NBA fans have expressed their displeasure on social media but the advertising trend — whether on team jerseys or in individual player deals with sponsors — is gaining momentum. Many WNBA players don’t understand why fans and players take issue with ads on jersey. Taylor points to financial reality. “A professional sport is a business. Every player is wearing a different brand of shoes. I see it as a great opportunity for the WNBA,” Taylor said. Will fans stop buying jerseys that promote something other than the team across the front of the uniform? “I don’t think so. Fans just want to watch the game. Watch people compete. Watch good players,” Dupree said. “Players just put on the uniform and lace them up,” Dupree said. The NBA’s deal will allow each individual team to sell a 2.5 inch by 2.5 inch space on the left shoulder. According to the NBA, the deal is expected to bring in $100 million dollars annually.